Pair of hand painted green and white ceramic onions candlesticks Hand painted ceramic onion candleholders. From Fitz & Floyd. Stand not included Measures: 6 x 3 x 3. Beautiful pair of 18th-19th century hand forged iron candleholders, Southern France, Spain, 18th-19th century. Weathered. 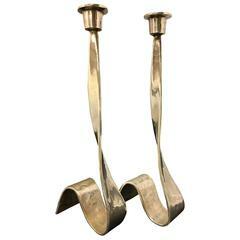 Striking pair of Brutalist style forged iron candleholders which are twisted and silver plated. Rugged, rough and highly polished creates a great look. Unsigned.